Today, if a technology item does not fit in your hand or come with apps you can play, it does not catch much attention. Printers are not often handheld, although I had a tiny portable printer years ago that was amazing until I fried it on a trip to London with the wrong power converter. Ouch. The new HP Color LaserJet Pro MFP-M177 does not fit in one hand. You’ll need both hands to move it, but it is worth considering for the small business that wants to make a big impression. I’ve always been a bit of a printer fan because I got my start in business doing desktop publishing work. 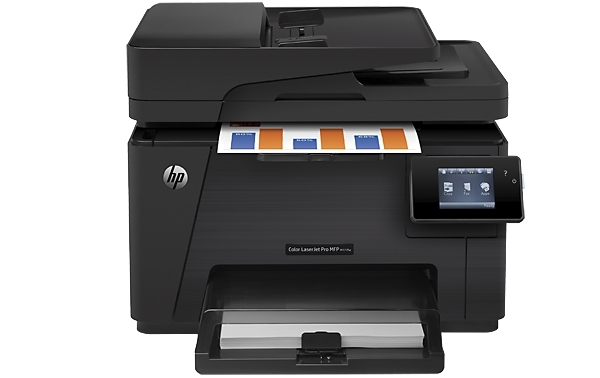 I have purchased many HP printers as they first hit the market, including some expensive workhorse laser printers. This new color laser from HP is awesome. I try not to “gush” in my reviews, but if you want crisp print – lasers are the way to go – and the LaserJet Pro MFP-M177 does not disappoint. Let me cut to the chase– street price on this printer is $299. That’s in range for almost any small business that needs a high quality printer that will fit on a desk and runs quietly. It is easy to use; many companies promise “plug and play” but HP really does it. I plugged it into one of my desktops and it quickly set itself up, no driver install/setup needed on Windows. I don’t own an Apple computer, but the specs show you can print with Apple AirPrint, too. It’s fast. Seventeen pages per minute in black and white; 4 pages in color. It has crisp 600 x 600 B&W resolution. For color, you get the ImageREt 2400 resolution (which, as I understand it – means you get the four primary colors in 600 dpi each. 600 times 4). MFP stands for multi-function printer. So, print, scan, fax, copy. Big copier functions so you can even copy both sides of an ID card onto one side of a page. Wireless capabilities so you can print from just about any mobile device. Easy to print envelopes or on smaller photo paper or postcards, one at a time. Yes, lots of printers also can do this. You can scan directly to email. The cool touchscreen display didn’t offer a button/icon to scan documents. I did the full CD install later and could scan from the desktop software itself. Load the doc, click scan and it worked. But I never had the scan icon show up on the touchscreen. One of the big concerns on color lasers, not unlike inkjets, is the cost to replace cartridges. The evaluation unit HP loaned me for this review came with a “starter” cartridge set, but the full cartridges run about $57 each and you need three (cyan, yellow, and magenta), plus black. In the specs it shows you get approximately 1,000 pages per color cartridge and 1,300 for the black one. That might be pricey for you or it might be cheap – to produce short run, custom documents for your marketing and sales efforts. You may be able to get a combo pack from Costco, Sam’s Club or Amazon. For the HP Color LaserJet MFP- 177fw printer technical specs, head to the official HP page. But you may decide to buy it from one of their many retailers, such as, Staples, Office Depot or Amazon. I have purchased and tested a number of printers and truly found this new LaserJet to be a winner at $299.